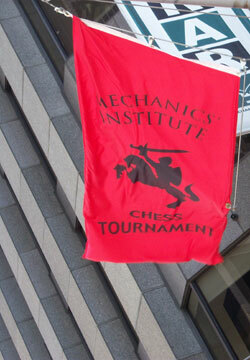 The 2nd Konig Memorial is currently being held at the Mechanics' Institute Chess Club in downtown San Francisco. The GM norm event is being run on the Scheveningen System in which two teams of five players play each of the other team's players twice, but not their teammates. Team A ( those seeking GM norms) is made up of five local IMs - Vladimir Mezentsev (born in 1959, FIDE rating - 2392), Dmitry Zilberstein (1979, 2410), Alan Stein (1975, 2412), David Pruess (1981, 2424) and Josh Friedel (1986, 2472). Their opponents are: WGM Ekaterina Atalik (1982, 2400), GMs Suat Atalik (1964, 2564), Alexander Baburin (1967, 2559), Alex Yermolinsky (1958, 2517) and John Fedorowicz (1958,2460). The Konig started over a week ago but due to scheduling conflicts it is hard to say who is leading. GMs Baburin and Fedorowicz will finish their schedule today while the Ataliks and Yermolinsky, who played in the just finished Canadian Open, are just getting started. Team B leads Team A 12 to 9 in the standings. Konig Memorial participants WGM Ekaterina Atalik and IM Dmitry Zilberstein. Photos courtesy Richard Shorman . The defense of choice in the Konig so far is clearly the Modern Benoni. All five members of Team B play 1.d4 and good friends and study partners Pruess, Friedel and Stein are in love with the Benoni. So far almost every round has featured the late Mikhail Tal's favorite answer to 1.d4 though I don't think he would have been entirely pleased with the results to date. Berkeley IM David Pruess escaped from difficulties in his first round Benoni battle with Bronx bomber John Fedorowicz but was mercilessly ground down a few days later by Irish GM Alex Baburin prompting the Fed to say " You can't play the Benoni against a well-prepared and solid player like Baburin. The tricks don't work." 9.Bg5 and ; 9.Bf4 are more commonly seen when Black often gambits the d-pawn. The text leads to a sort of hybrid between the Knight's Tour ( Nd2-c4) and Fianchetto variations which has not been played as often as other Benoni lines..
9...b6 10.a4 Ba6 11.Nb5 Ne8 12.Bf4 Nd7 13.Bg2 g5?! The loss of the castling privelege is not as significant as the looseness in Black's structure. At first glance Black looks okay but closer examination reveals that his Bishop has nothing to hit at while White has targets on a7 and f5. Simple chess. White trades off Black's active Rook. 31.Bc2 Be5 32.Rd1 with Qb7 and Rd5 maybe followed by e4. The text needlessly pitches a pawn. 31...Kh6! 32.Bc2 Be5 33.Rd1 Kxh5 34.Rd3 Kg5 35.Qb7 Qe6 36.Rd5 c4 37.e4 fxe4 38.Bxe4 Kf6 39.Bxh7 Ke7 40.Be4 Bxg3?? Black spent his last time (about 2 minutes) on this move - and went wrong! I suspect that he hoped to win the game. Instead, 40...Rxd7 41.Rxd7+ Qxd7 42.Qxb6 c3 White is better, but it should be a draw (Baburin). Alan Stein, who grew up in Palo Alto near Stanford University, has been making steady the past few years picking up his IM title and making a successful debut in the 2006 US Championship. Several observers at that event noticed that Alan bears a resemblance to the late Steve McQueen. Some might beg to differ but there is no question that the first Baburin-Stein encounter at the Konig could be safely dubbed "The Great Escape" for Alan. Their second game was nicely played featuring an intriguing ending. 4.Qc2 is strongly associated with Baburin who has played it many times but recently he has switched to 4.e3. His knowledge gained in writing Winning Pawn Structures, the best guide to isolated queen pawn structures on the market, is no doubt useful as the 4.e3 Nimzo often leads to IQP positions. This flexible setup was a great favorite of Karpov in the late 1970s. White had a tough choice to make here as 15.Rad1 Bb7 (15...Nfe4 16.Bxc5 Nxc5 17.d6 Qd8 18.Ne5) 16.d6 Qc8 17.Ne5 also looks promising. 15...Bd7 16.Nb5 Qf4 17.g3 Qh6 18.Bxc5 bxc5 19.dxe6 Bxe6 20.Nd6 Bxc4 21.Qxc4 Rxe1+ 22.Rxe1 Qh5! 26...Nxc3! 27.Rc7 Nxa2 28.Nf5 a5 29.Rxg7+ Kh8 30.Rc7 a4 31.Nd6 (31.Ne3 Nb4 32.Ng4) 31...Nc3 (31...a3 32.Ne4) 32.Rxc5 a3 33.Rxc3 a2 34.Rc1 a1Q 35.Rxa1 Rxa1= was a draw. Now Alan gets into trouble but wriggles out at the last moment due to the passed a-pawn - Knight's hate rook pawns. Despite fighting hard in all four games Alan has started the Konig with four draws. Pre-game chatting and psyching up for the 2nd Irme Konig Memorial. Alan Stein and Ekaterina Atalik in the foreground. Photo John Donaldson. The 2nd Konig Memorial is named after the late Imre Konig ( 1901-1992), the first international player to play at the Mechanics'. Konig, who learned the fine points of chess from Richard Reti while studying in Vienna represented Yugoslavia in two Olympiads during the 1930s. He moved to England in 1938 and made it his home for over a decade before settling in California. It was in England that he wrote his influential book From Morphy to Botvinnik: A Century of Chess Evolution that is still read with profit more than 50 years after its publication. The 2nd Konig Memorial is made possible by the generosity of Imre's good friend, Tibor Weinberger. The host for the tournament, the Mechanics' Institute, was founded in 1854, shortly after the end of the Gold Rush by some of the ambitious souls who had made the hazardous trek West and wanted to make San Francisco their permanent home. They pooled their resources and formed an educational institute designed to keep their members abreast of technological change ( Mechanics had a much broader meaning then encompassing all sorts of professions than we associate with the word today). Many of the Institutes' early acquisitions were delivered by Wells Fargo's Pony Express. The oldest continuously operated chess club in the United States, with over 150 years of operation, the MI has hosted all the Classical World Champions from Lasker to Karpov, except Botvinnik. It's open 7 days a week and runs an active program with over 30 tournaments a year including it's ongoing Tuesday Night Marathon that brings 70-80 players to the club each Tuesday night for USCF rated battle. Weekly lectures by Grandmaster-in-Residence Alex Yermolinsky are complemented by a twice a week children's programs and classes for women taught by Women's Grandmaster Kamile Baginstaite. These educational programs are made possible by the Wiskemann Foundation.